If I ever open a movie studio — an eventuality which, I assure you, will not come to pass — there will be a golden rule etched above the front door. Now, I am not eschewing romance altogether. Along with cowboys, monsters and far-off places, romance is a cornerstone of the artform. But when a superfluous coupling invades an otherwise fine motion picture — as is the case in The Mountain Between Us — it hangs around a film’s neck like a gangly, open-mouthed albatross. 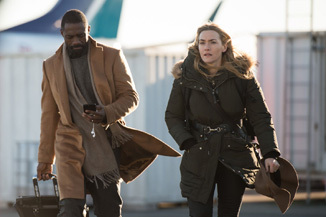 In the otherwise serviceable film from Hany Abu-Assad, Ben (Idris Elba), a doctor, and Alex (Kate Winslet), a photojournalist, charter a single-engine plane to get them from Idaho to Denver ahead of a coming storm. The small craft’s pilot suffers a stroke mid-flight, leading to a crash landing in the Rocky Mountains; with no flight plan filed for the hasty journey, Ben and Alex must reckon not only with the difficulty of survival but the possibility that no one is coming to look for them. As a tale of desperate, improbable survival, it works well; Elba and Winslet are excellent choices for a tense two-hander, and the story (based on a novel by Charles Martin and adapted by Chris Weitz and J. Mills Goodloe) does a fine job of increasing the stakes and varying the circumstances in spite of the confined setting.